Many fires burn beneath the earth. There is one vision coming from both (eyes). 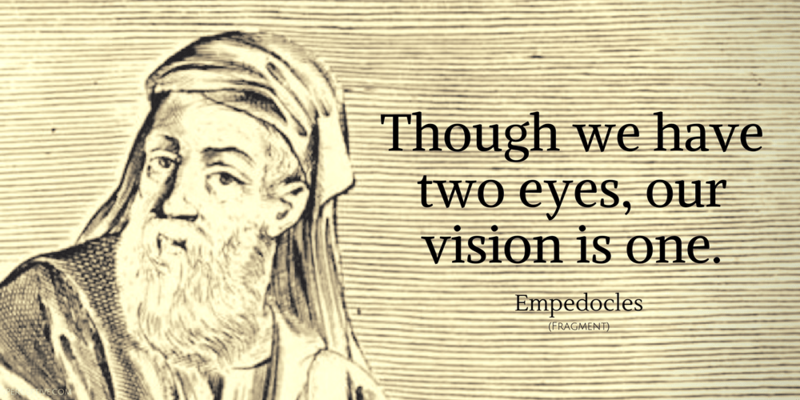 Though we have two eyes, our vision is one. Heaven's exiles, straying from the orb of light. Know each thing in the way in which it is clear. But come, hear my words, for truly learning causes the mind to grow. Will ye not cease from evil slaughter? See ye not that ye are devouring each other in heedlessness of mind? 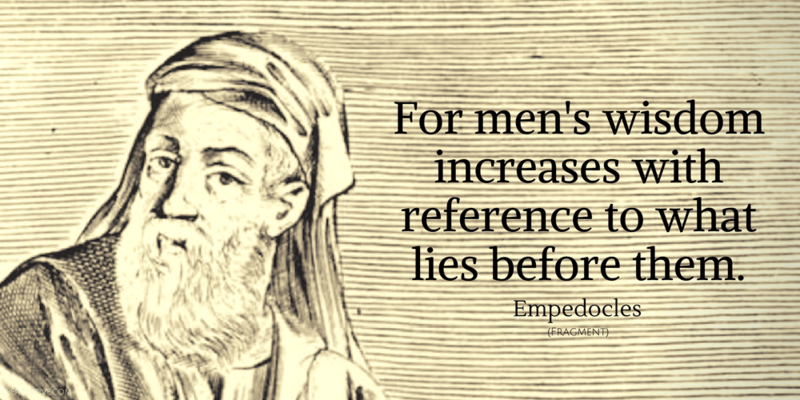 For men's wisdom increases with reference to what lies before them. For water is increased by water, primeval fire by fire, and earth causes its own substance to increase, and air, air. Hear first the four roots of all things: bright Zeus (fire), life-giving Hera (air), and Aidoneus (earth), and Nestis (water) who moistens the springs of men with her tears. For it is by earth that we see earth, and by water water, and by air glorious air; so, too, by fire we see destroying fire, and love by love, and strife by baneful strife. For out of these (elements) all things are fitted together and their form is fixed, and by these men think and feel both pleasure and pain. For all things are united, themselves with parts of themselves—the beaming sun and earth and sky and sea—whatever things are friendly but have separated in mortal things. And so, in the same way, whatever things are the more adapted for mixing, these are loved by each other and made alike by Aphrodite. But whatever things are hostile are separated as far as possible from each other, both in their origin and in their mixing and in the forms impressed on them, absolutely unwonted to unite and very baneful, at the suggestion of Strife, since it has wrought their birth. But come, gaze on the things that bear farther witness to my former words, if in what was said before there be anything defective in form. Behold the sun, warm and bright on all sides, and whatever is immortal and is bathed in its bright ray, and behold the raincloud, dark and cold on all sides; from the earth there proceed the foundations of things and solid bodies. In Strife all things are, endued with form and separate from each other, but they come together in Love and are desired by each other. For from these (elements) come all things that are or have been or shall be; from these there grew up trees and men and women, wild beasts and birds and water-nourished fishes, and the very gods, long-lived, highest in honour. And if your faith be at all lacking in regard to these (elements), how from water and earth and air and sun (fire) when they are mixed, arose such colours and forms of mortal things, as many as now have arisen under the uniting power of Aphrodite. . . .
How both tall trees and fishes of the sea (arose). And thus then Kypris, when she had moistened the earth with water, breathed air on it and gave it to swift fire to be hardened. And all these things which were within were made dense, while those without were made rare, meeting with such moisture in the hands of Kypris. And thus tall trees bear fruit (lit. eggs), first of all olives. Wherefore late-born pomegranates and luxuriant apples . . .
Wine is water that has fermented in the wood beneath the bark. 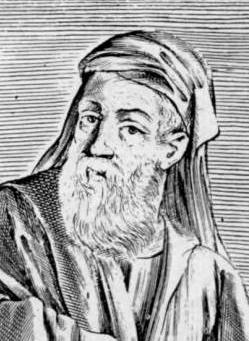 Empedocles was an ancient Greek pre-Socratic philosopher, who is best known for his influential set of ideas that described the nature of the universe, namely the four elements.. We only have fragments of his works today.